Opinions and suggestions from our readers. Eight more distinctive bungalows from house-proud owners. A visit to Hubbard’s Arts and Crafts Colony. The Roycroft Inn welcomes visitors to its Craftsman suites. 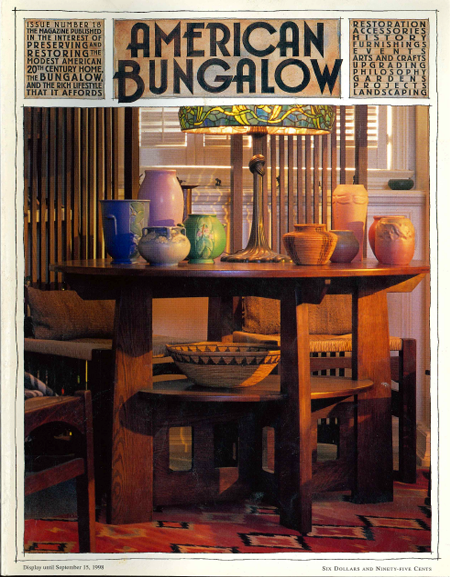 Fine furniture collectibles from an Arts and Crafts master. A historic court offers a second chance to succeed. Michigan’s art pottery is alive and well in Motor City, USA. An Arkansas bungalow is reborn after a devastating fire. Winter and Spring events, preservation upgrades and news from the Arts and Crafts world.